Southern Nevada is one of the fastest growing areas in the United States and is expected to grow for the next 20 years. 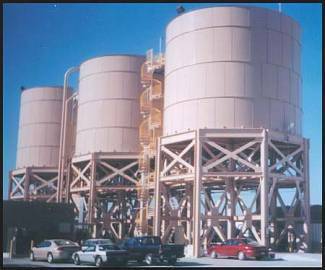 In response, California Portland Cement has constructed a transfer terminal in the city of North Las Vegas capable of transferring 500,000 tons of cement per year to the Nevada market. The terminal is designed to off load 100 ton railcars at a rate of 200 tons per hour into three 1200 ton steel silos using a pneumatic conveyor system. A dedicated double rail spur will accommodate up to 30 railcars by simply feeding cars from one spur to the other. Three silos permit the handling of more than one product and three adjustable loading spouts accommodate a variety of truck configurations. The city of North Las Vegas, surrounding landowners, and developers required that the terminal height be minimized to mitigate the visual impact of the terminal on other developments. A maximum overall height of 62 feet was considered acceptable. The terminal configuration is designed to blend with the surrounding land use and be aesthetically acceptable to the city and local developers. Loadout station equipped with two loading spouts and positioners. 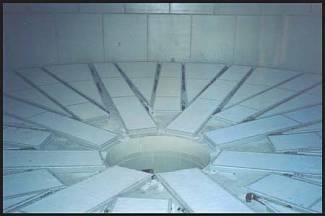 The cement is conveyed from the silo bin bottoms to the loading spouts by aeration conveyors. The two outboard loading spouts incorporate 2 feet by 6 feet horizontal positioners on 53 feet centers. 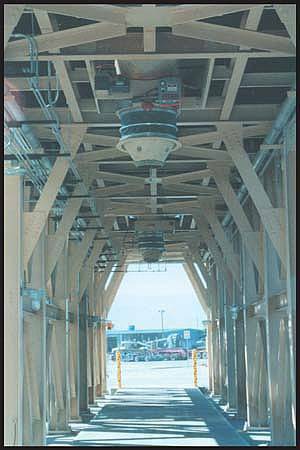 The spouts reach truck hatches from 47 feet to 59 feet apart which satisfies most all trucks using the terminal. A third spout and 2 feet by 2 feet positioner is used in the center to accommodate triple trailer rigs. Each loading point is provided with an integral dust collector eliminating the need for duct and maintenance associated with a remotely mounted dust collector. A 130 feet long above ground scale is supplied as two independent platforms allowing the simultaneous loading of each trailer reducing the loading time. Dual trailer 120,000 LB Nevada rigs are loaded in 5 minutes. The loading spouts are fitted with self sealing cones which close the discharge when not seated in the hatch. The self sealing cones reduce house keeping requirements eliminating cement dribbling from the spout when retracted. One hundred ton railcars deliver cement to the terminal. The cement is unloaded through two unloading boots which seal against the rail car discharge doors. 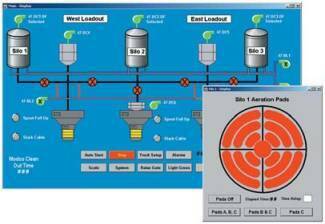 The cement is discharged into two inclined drag conveyors and conveyed to a dilute phase dual pod conveying system that delivers the cement to one of the three selected silos. The pneumatic conveyor was chosen to maintain a low elevation profile on top of the silos and to allow for the future expansion of the conveying system. DCL’s flat bottom silo aeration configuration, typical for all three silos. yet accommodate the storage requirements, a 38 feet 6 inch diameter fully aerated 8 degree silo bottom is incorporated. The silo bottom is provided with aeration pads covering 90% of the surface. The pads are segmented and selectively valve controlled to the required location to limit the blower size to 600 CFM. The resultant reclaim capability is 99.6% of the stored product. filling as well as the silo aeration sequence is automatic once initiated through the start button. The scale is of a twin platform design allowing the filling of two trailers simultaneously reducing the filling time while maintaining control of each trailer weight. Inventory and shipping data is transmitted to CPCC offices by data line.